Squeaky Books: Spring into Summer Read-a-Thon-- Sign Up & Information! Spring into Summer Read-a-Thon-- Sign Up & Information! All right, people! This is OFFICIALLY going to happen! I will be hosting (and participating in) my first ever READ-A-THON!! Since this is my first experience with a read-a-thon, I dunno if it'll be the same experience as other read-a-thons, but I hope it'll still be fun! 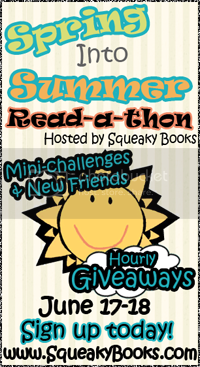 The read-a-thon will start Friday June 17th at 8am MST to Saturday June 18th at 8pm MST. Thirty-six hours of non-stop reading and fun! There will also be a prize for the person who read the most (and no cheating with picture books) during the read-a-thon! This will be judged by me, and perhaps a few other trusted sources. And JUST FOR SIGNING UP you will be entered to win a $25 gift card to Amazon.com! A lot (but not all) of these giveaways will favor bloggers. But since over 85% of the people who filled out my survey were some kind of blogger, I think we'll be okay. How do you sign up? Well, you have to fill out the form. And... that's it. If you want to win the GIFT CARD, then you have to write a post for your blog that says you are going to participate. OR, you can just copy paste the post I wrote for you (in the box below). BE WARNED: there are some things you need to fill out in that post. They should be red and noticeable. You want to do this, because every person YOU get to sign up for the read-a-thon will earn you AND THEM five (5) extra entries towards winning the gift card. And since this is an electronic giveaway, it is open internationally! 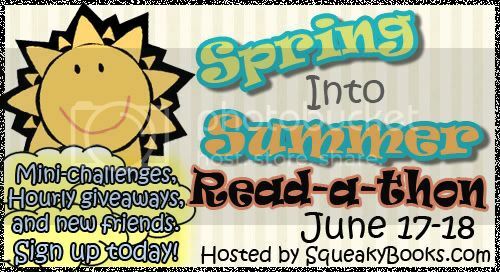 This post is to announce to the world that I'm participating in the Spring into Summer read-a-thon hosted by Enna Isilee of <a href="http://www.squeakybooks.com/">Squeaky Books</a>! This read-a-thon is going to be so great! It's two days where you try do NOTHING but read. It's a great chance to get rid of some of those books that have been sitting on your TBR pile <em>forever</em>. But that's not all! There will also be awesome mini-challenges and a TON of giveaways! In fact, just for signing up you are entered to win a $25 gift card to Amazon! SO <a href="http://www.squeakybooks.com/2011/06/spring-into-summer-read-thon-sign-up.html">GO SIGN UP</a>! And if you say that <strong><span style="color: red;">INSERT YOUR NAME HERE</span></strong> sent you, you'll get 5 extra entries to win that gift card! <a href="http://www.squeakybooks.com/2011/06/spring-into-summer-read-thon-sign-up.html">CLICK HERE</a> to enter to win, and know all there is to know about the read-a-thon. Still trying to decide what I'll read for it though. I'm going to try to make this work! I haven't done a readathon yet! My first readathon! :) It should be good! This is a fabulous idea! I'm a new follower and I just signed up for the read-a-thon. Can't wait! I have been wanting to participate in a read-a-thon for forever, so this is perfect!! Thanks so much, it is going to be great! Does that mean you can't sleep for 36 hours? This is such a good idea! I'm looking forward to it. I'm travelling that day and it'll give me something to do on the ferry! Certainly not! I intend to sleep for quite a while between the days. I can't read if I'm tired. If people enjoy this read-a-thon, do you think you'll be hosting another? I added the button (http://themodpodgebookshelf.blogspot.com) and, of course, forgot to add that to the form I just submitted, sorry, Enna! This is my first read-a-thon too. Pretty psyched. This will be my first read-a-thon, well, officially. I read like crazy all the time...well, when I can sneak a day past the hubby and kids or stay up all night. I'm going to read something that's not YA. I've read so much of it I've neglected my other books. Sounds fun - can't wait! For this readathon do you have to read the entire time, or can you just choose specific blocks of time for those 36 hours? (Does that make sense?) I know I am going to have a lot of homework those days but I'd like to participate by setting aside a couple of 5 or six hour blocks if I can! I am all signed up! Bless you for making the post for us!!! Thank you!!! L.L., If it's the readathon that's making you read, then anything counts. For instance, I won't be able to read for the first 4 hours because I'll be at work, but I'll participate the rest of the time. Some people are only participating on one day. You don't have to read for the full 36 hours. In fact, I recommend you put sleep somewhere in there. Fun, fun, fun! Read-a-thon addict here! All signed up...can't wait! Also, totally a new follower. I'll probably only read one book cause I'm not that fast of a reader, but 1 book in 1.5 days would break my record of 1 book in 2.5 days (including breaks, mind you). Can't wait till next weekend. So excited!! This is my first read-a-thon. :) I have a nice selection to choose from. I won't be able to start until 5 pm CST but I plan to make up for it. The best part is that the hubs will be working most of that time! Woot! I love readathons! :) Posted, getting ready to tweet, sidebar banner up ... fun! Awesome! Thanks for putting this all together. This will be my first read-a-thon I've been able to participate in. I better be looking at that TBR pile!! Looking forward to the Readathon! This sounds fun! Though probably wont be able to get that much reading in today and tomorrow but will try as much as possible! Can i still participate in this? I really want to. It'll be my first time and i wasn't aware this was happening. Sorry. It's all over! The read-a-thon ended about 5 hours ago.